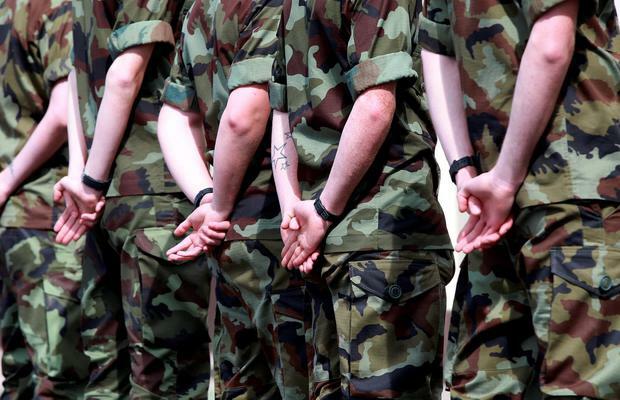 Ten candidates have applied for every vacant post for general service recruits in the Defence Forces. Figures for the latest recruitment competition have now been finalised and show a huge response for jobs in the military despite the significant numbers who were leaving early. This exodus was largely blamed on poor pay rates for young soldiers. However, it is expected that about 800 personnel in total will be taken into the Defence Forces this year, of which 670 will be general service recruits. The rest will be comprised of cadets and specialists. Two recruitment competitions were held in order to fill the vacancies this year. The first was held in September and October last year, and attracted 2,954 applicants. Those who were successful are now filling the first recruit classes of 2018. The second competition was held over the past two months and resulted in 3,447 applications. Overall, this means a total of 6,401 applicants for the 670 positions available. The switch to two competitions rather than one was introduced this year and is a policy which is aimed at reducing waiting times on panels. The Defence Forces are currently taking in more personnel annually than in previous decades despite competing in a rising economy with much improved employment prospects. The biggest problem facing the authorities is to hold on to serving personnel. Earlier this year, the Irish Independent disclosed a massive exodus of fully trained troops from the military organisation. And a recent survey of 167 personnel who opted to be discharged early from the Defence Forces showed that the vast majority were leaving in search of better pay and conditions elsewhere. Military representative groups were angered that they had been left out of "side deals" on pay done with the likes of the gardaí. As a result, the Department of Defence and military management lodged an urgent joint submission to the public sector pay commission to increase the pay of the junior ranks, particularly, in an effort to stem the flow of those seeking better paid jobs elsewhere. Many of those struggling to make financial ends meet qualify for the family income supplement because they are so badly paid. Minister with responsibility for Defence Paul Kehoe has acknowledged that the pay rates need to be reviewed, and the representative association for general service personnel, Pdforra, is seeking an increase of €2,500 a year in the special military allowance.